Last week we did an introduction to the primal lifestyle and talked about the diet portion. This week we’re going to look at the exercise recommendations and the other aspects of the primal lifestyle like sunshine, sleep and medicines. There’s no one accepted definition of what exactly primal fitness is. Some people are outside, lifting rocks and hurling sticks. Others are in the gym, doing Crossfit and P90X. That seems to be quite a disparity, but I’m not really sure it is. The principle at the heart of primal fitness is that of “kill or be killed,” which makes perfect sense given the harsh nature of neanderthal’s environment. You’d need to be strong and fast to escape the behemoth beasts that were stalking you as much as you were them. How one accomplishes the strength and speed necessary is really of little importance in my estimation. Whether you’re carrying jugs of water or rocks, so long as you’re lifting heavy objects and exerting yourself, I don’t see why it would matter if it were a modern thing or an ancient thing. Moreover, as with all programs, there will be those sanctimonious few who use their purity in following a program to belittle and demean others. It’s like high school, except with lots of grunting. Use what you’ve got; I can’t imagine anything more primal than that! There are a few common threads in the ideas of primal fitness that are important. 1. Fitness should be integrated into your daily life. The idea isn’t that you have to be at the gym every time the doors are open; that sort of religiosity just isn’t necessary. You can exercise by playing with your children, mowing the lawn or taking a swim. The idea that we don’t have to slave away, sacrificing time with family and friends to get a good burn, is very freeing. Of course, that’s not enough of a workout to run a marathon, but we need to know why we’re exercising in the first place. Is it to look a certain way or to be able live your life and do the things you want to do? For me it’s both, which is why I lift weights, eat carefully and put miles on my Vibram’s. 2. Low-level cardio instead of “chronic cardio.” Primal believes that you’ll want to engage in cardiovascular exercise that generally keeps you between 55 and 75 percent of your maximum heart rate. Two hours per week is the minimum recommendation, which is less than the American Heart Association’s current recommendation of 30 minutes at least five days per week. AHA also recommends 60 to 90 minutes to lose weight or maintain weight loss, which is an enormous difference in guidelines. It’s a huge switch for most of us to think about adding at least two, preferably four to five, hours of play and physical leisure activities to our weeks, but if we achieve no other benefit, the stress relief is worth it. These first two ideas are more about changing the idea of work and play than exercise itself. They remind us to get out of our cubicles and corner offices and attempt to see beauty again. To enjoy nature, our families and friends and ourselves within it. To live life. 3. Short, intense bursts of anaerobic cardio. If you’re sprinting away from a predator, you’d better not have your hands on your knees after twenty seconds, sucking wind. Interval training can keep your heart strong without requiring huge amounts of time. Twenty minutes of total running, alternating between a full-on sprint and an easy jog, should do the trick. Of course what an all-out sprint means will depend completely on your level of physical fitness. For me, that’s about a five-minute mile (a 12 on the treadmill). Personally, I don’t have the discipline to do those runs outside, as only the treadmill can keep my legs moving as fast as they must for sixty seconds. About forty seconds and my lungs are screaming and want to quit, so the treadmill’s pace keeps me accountable. 4. Heavy lifting when necessary. For us, there’s almost never a reason to lift heavy things, but there would’ve been for Grok, our ancestral archetype. Whether he was lifting boulders, or his mate was carrying thirty pounds of toddler, there were reasons to lift. 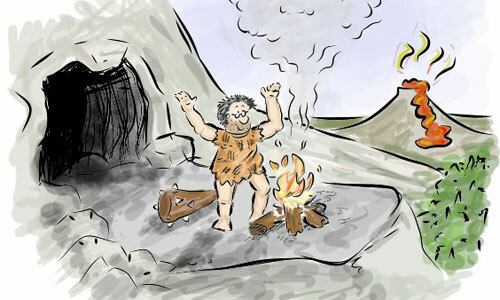 Neanderthal would likely also have climbed trees or tall rocks to escape predators or scouted the next area to forage. Pull-ups, anyone? The point is to be sure that you’re getting at least fifteen to twenty minutes of lifting in a couple of times per week. Besides diet and exercise, there are other prescribed elements to the primal lifestyle. 1. Getting plenty of sunshine. Our ancestors would have gotten lots of sun exposure. Science is starting to recommend getting off the major sunscreens for short jaunts in the sun, and I couldn’t be happier. The chemicals in sunscreen are deadly, and our vitamin D stores are at all-time lows. Fifteen minutes with bare skin is enough to regain “normal” D levels, but is it enough if you want vibrant health? I prefer at least two fifteen minute sessions per day, neither in high sun, to still keep a line-free, relatively fair complexion. 2. Exposure to cold water. The Primal Blueprint says we would have regularly bathed in cold water. I’m not sure I buy this one, as it seems it would depend highly on the geography of the area. Of course, since Grok would’ve lived in the San Joaquin Valley, the water temperature would’ve been cold. But what about the neanderthal in western Asia? Would they have bathed only in cold water? 3. Sleep. I once heard a scientist say that the optimal sleep/waking cycle for humans, kept only in artificial light conditions, would be four hours on and four hours off, day after day, forever. Besides the fact that it would be ludicrous, that theory discounts how much we need our circadian rhythms. Primal says we need to honor our bodies’ sleep needs by not only going to sleep when it gets dark and waking when it’s light, but also napping during the day. I’ve always been in support of lots of sleep and regular naps (i.e. whenever I feel I need one). Primal also advocates ditching the alarm clock in favor of letting the body begin to wake naturally. As a work-from-home mom, I have that luxury and I do feel it keeps us healthier. Too bad for my working stiff husband, who has to rise by 5:30 to make it to work on time. 4. Medicine. Primal says we don’t take any, but I beg to differ. Of course I’m not at all about taking prescription cocktails and loads of manufactured drugs, but there is a place for medicine. Current primal is for life-saving drugs (of course, they’d be sued like mad if they said they were against them), but is generally in favor of developing such good health that drugs aren’t necessary. However, even a bit of cursory research shows that the neanderthal most certainly used salves and herbs, which are most certainly medicine. They are medicine as it should be, natural, gentle and functional. Primal exercise is about relaxation and fun most of the time, and serious work a couple of days per week. I think there’s something for everyone to learn from the philosophy of an easy lifestyle that belies the wisdom of the age, which is to work for work’s sake. Have you tried primal living? What have your experiences been?